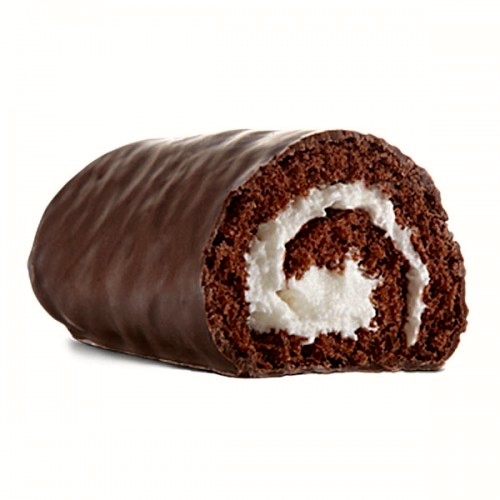 Ho Hos are small, cylindrical, frosted, cream-filled [in the U.S., creme-filled] chocolate snack cakes with a pinwheel design based on the Swiss roll. 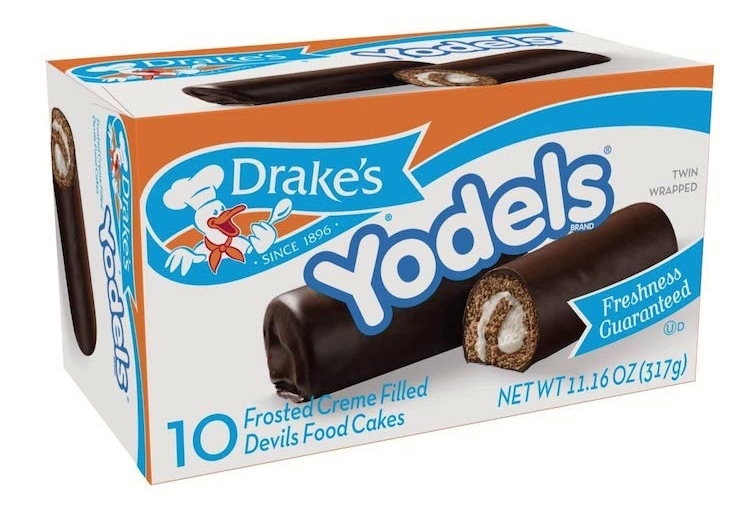 Made by Hostess Brands, they are similar to Yodels by Drake’s and Swiss Rolls by Little Debbie. 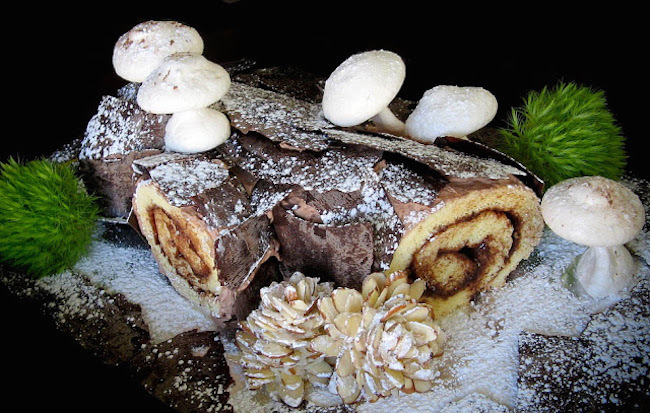 Made of sponge cake to resemble a miniature actual Yule log, it is a form of sweet roulade. noun roulade: 1 a dish cooked or served in the form of a roll, typically made from a flat piece of meat, fish, or sponge cake, spread with a soft filling and rolled up into a spiral. A Swiss roll, jelly roll, or cream roll is a type of sponge cake roll filled with whipped cream, jam, or icing. The origins of the term are unclear. 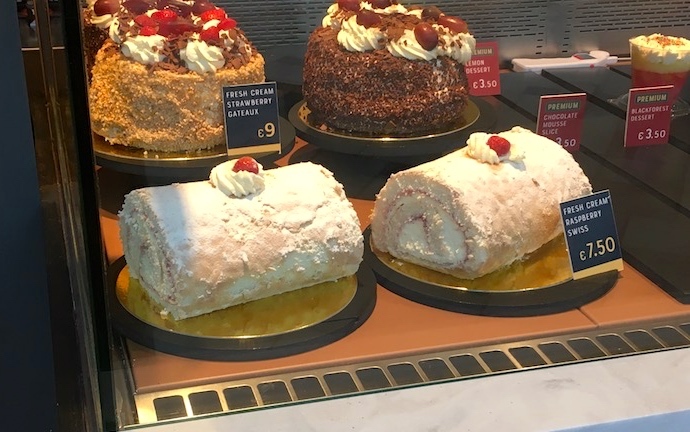 In spite of the name Swiss roll, the cake is believed to have originated elsewhere in Central Europe [see my 12/15/18 posting “Regionally ambivalent Switzerland” on Switzerland as located in central Europe], likely Austria. It appears to have been invented in the nineteenth century, along with Battenberg, doughnuts and Victoria sponge. The connection to Switzerland is probably some combination of the association between Swiss chefs and fine cooking; a reference to French pâtissiers (pastry makers and sellers) in Switzerland; an allusion to Swiss and Austrian desserts of similar type; and Swiss associations with chocolate, as in chocolate roll cakes. In recent times, jelly rolls are made with jam (especially raspberry jam) rather than jelly. My usage, from childhood on, distinguishes jelly rolls (filled with jam) and Swiss rolls (filled with other spreadable foodstuffs: whipped cream, pastry cream, frosting, Nutella, etc. ), and some others share the distinction. More on this terminology below. 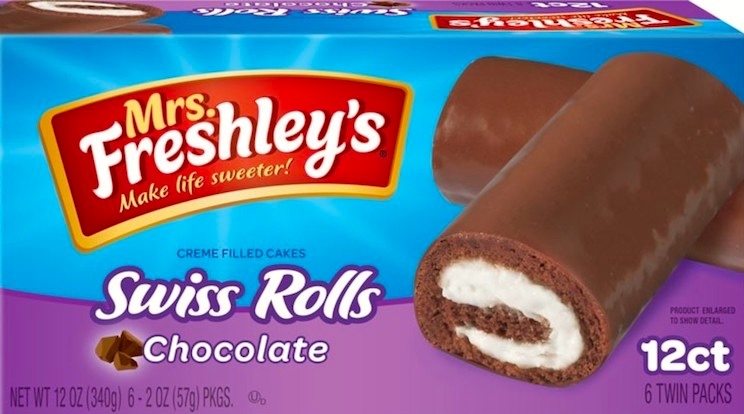 … Switzerland: Despite its name, the Swiss roll did not originate in Switzerland. 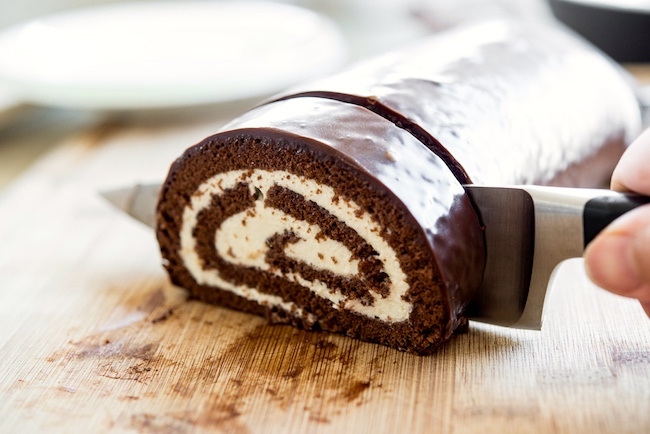 Swiss rolls are called Biskuitroulade or Roulade in Swiss Standard German, gâteau roulé or roulade in French, and biscotto arrotolato in Italian. 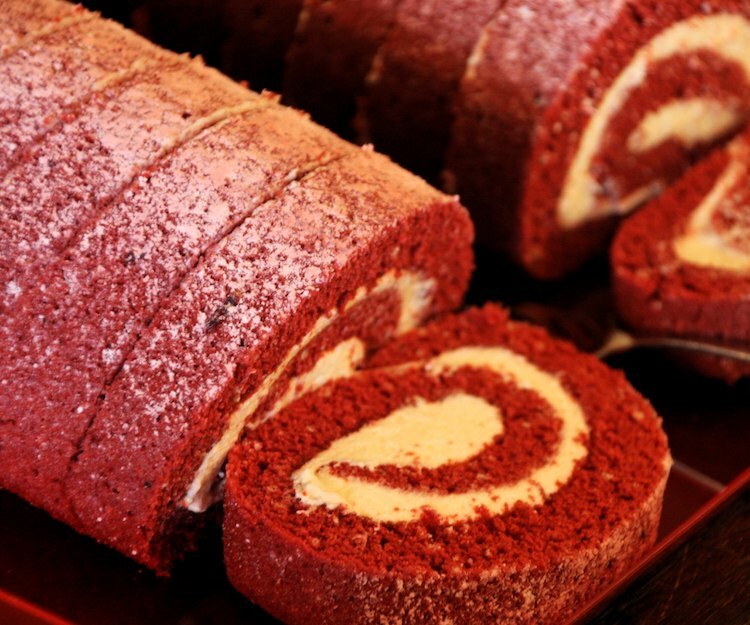 … United States: American pastry chefs and menus in fine dining restaurants often use the French term Roulade. The chocolate Swiss roll, sometimes called a chocolate log, is a popular snack. Produced by many commercial bakeries, common brands include Ho Hos and Yodels, which are smaller sized rolls for individual consumption. When the filling is ice cream, it’s commonly referred to as an ice cream cake roll, and although they can vary, these often consist of chocolate cake with vanilla ice cream. 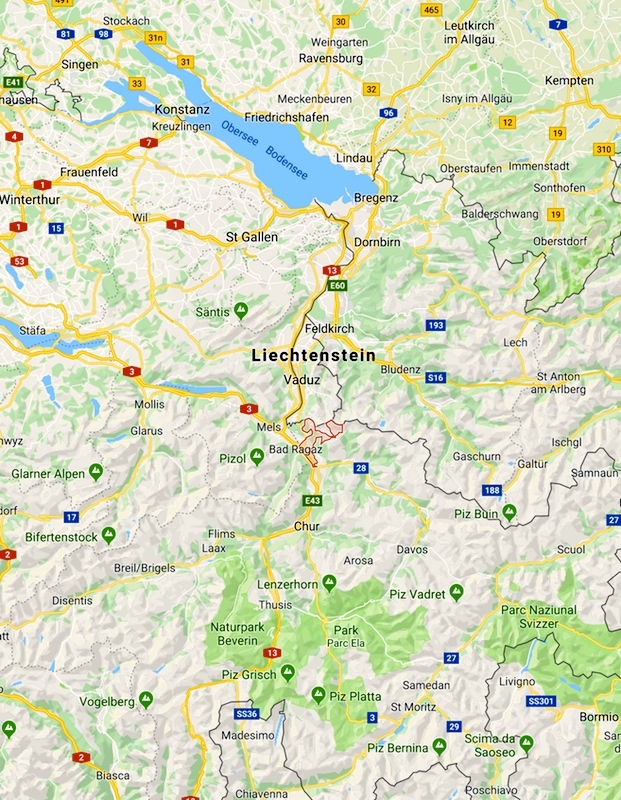 Obviously this is part of another chapter in my postings on things with Swiss in their name: Swiss cheese, Swiss Army knives, Swiss steak, the Swiss Hotel, etc. I asked my respondents to answer without looking things up; I was inquiring into people’s usage, not testing their knowledge. My cautions appear to have scared almost everyone off, but I got two thoughtful responses, both from men, both citing cake roulades with jam in the filling. 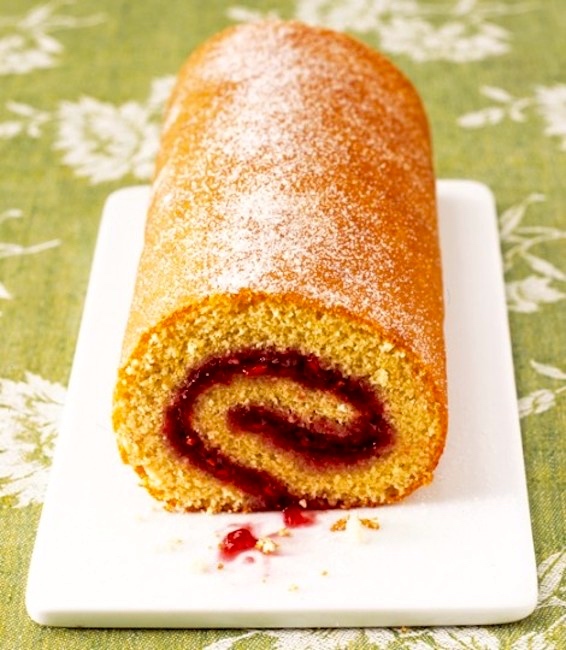 A swiss roll is a sponge cake spread with jam (and perhaps a cream filling, as well) and then rolled tightly. It is served sliced so that you see the swirls of jam (and cream). I think the sponge was mostly a vanilla sponge though I have vague memories of them being chocolate flavored. Its possible that the chocolate sponge ones came with a cream filling but the vanilla ones came with a jam filling. Growing up in Ireland, we would have this for tea sometimes – always store bought, though. A variation on the theme – is to cover the whole thing with chocolate. My memories of this, though, are that this was only for miniature swiss rolls. 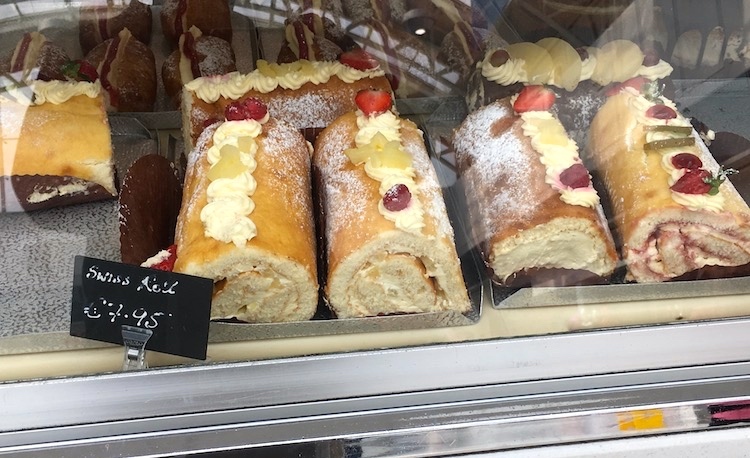 A Swiss roll is a kind of cake consisting of a thin slice of plain sponge cake (approx 1 cm thick), spread with red jam (strawberry/raspberry), rolled up into a snail-shell shape, then cut crossways. It might also be dusted with icing sugar or something similar. Sumptuous cakes that would make any Swiss (or Parisian or Viennese) pâtissier proud. Accompanied by a dirndl or similar peasant costume, the hairstyle is likely to be called Swiss; otherwise it’s French. noun dirndl: 1 (also dirndl skirt) a full, wide skirt with a tight waistband. 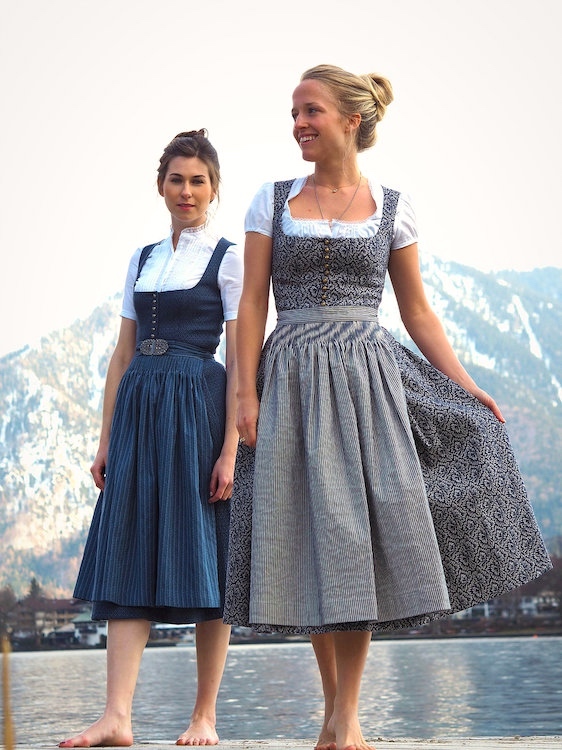 2 a woman’s dress in the style of Alpine peasant costume [of southern Germany, Austria, and Switzerand], with a full skirt and a close-fitting bodice. ORIGIN 1930s: from south German dialect, diminutive of Dirne ‘girl’. 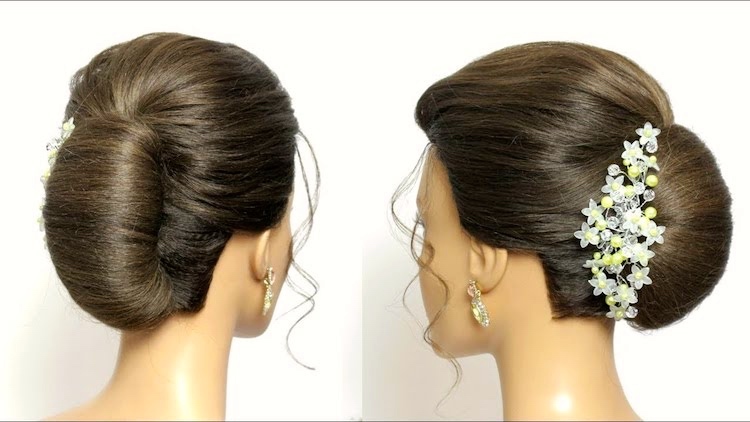 All three styles involve gathering up the hair at the back of the head. 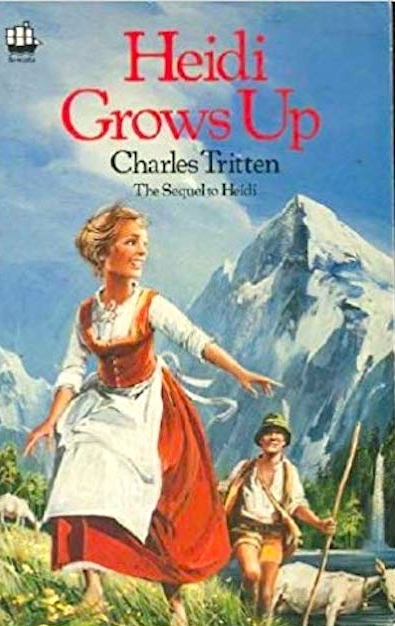 Heidi is a work of children’s fiction published in 1881 by Swiss author Johanna Spyri, originally published in two parts as Heidi: Her years of wandering and learning (German: Heidis Lehr- und Wanderjahre) and Heidi: How she used what she learned (German: Heidi kann brauchen, was sie gelernt hat). It is a novel about the events in the life of a young girl in her grandfather’s care in the Swiss Alps. It was written as a book “for children and those who love children” (as quoted from its subtitle). Unlike sourdough, Dutch crunch is not a particular type of bread. Rather, the name refers to the crackling, crispy topping created by painting dough with a paste of rice flour, yeast, sugar, salt and a fat such as butter or oil. The bread rises as it bakes in the oven, but the gluten-less rice flour paste does not, causing the topping to crack. Dutch crunch can be added to any type of bread, but it typically tops soft, slightly sweet French rolls, creating an intriguing contrast in taste and texture. with first element French bread ‘white bread in a long, crisp loaf’ (NOAD), and, by extension, similar baked bread in other forms. To a Swiss person, Switzerland is not so much the land of cheese or chocolate, it is the land of bread. However, if you ask most any North American or British person about the bread in Switzerland, they will tell you how they miss their soft, crust-less bread from back home. … Swiss breads are generally very crusty. 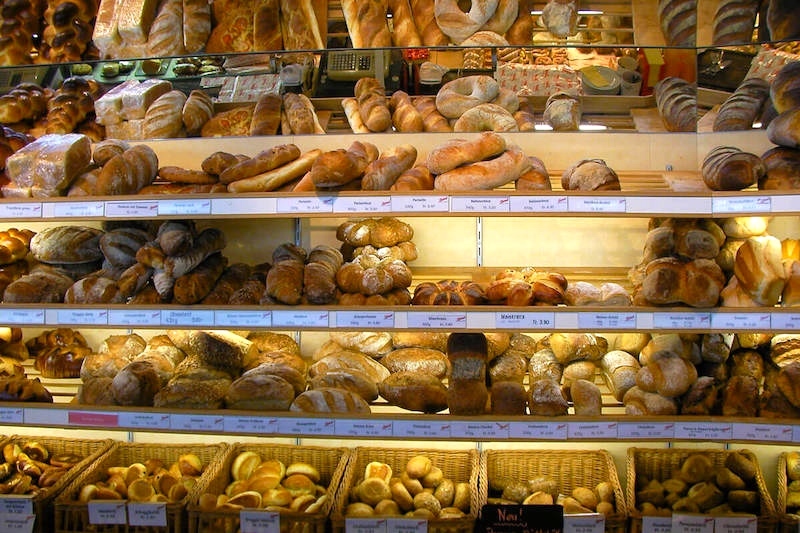 … If you love bread, Switzerland is a country for you. There are over 200 different traditional breads in Switzerland, including 22 special cantonal bread varieties. They were officially recognized in the middle of the 19th century when Switzerland officially became a democratic republic. noun roll-up: 2 US an article of food rolled up and sometimes stuffed with a filling: ham roll-ups. 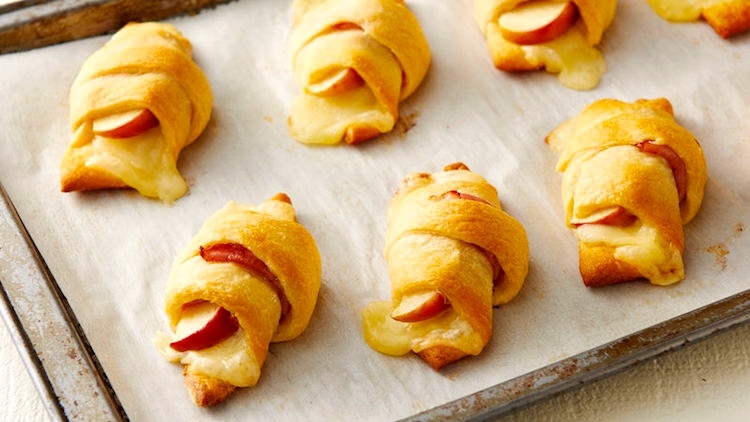 There are Pillsbury Sweet Hawaiian Crescent Roll dough wrapped around slices of ham and Swiss cheese and an apple slice, and then baked. Well, four Swiss rolls ought to be enough. Though you could imagine a gymnastics movement called a Swiss roll, or a particular type of cylinder, or a sound (say, the noise made by Alpine thunder). 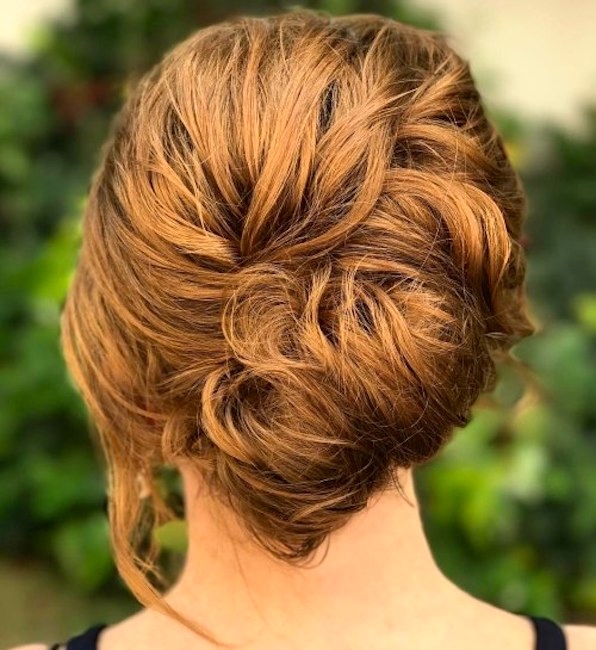 This entry was posted on December 17, 2018 at 12:50 am and is filed under Clothing, Compounds, Language and food, Names, Switzerland and Swiss things. You can follow any responses to this entry through the RSS 2.0 feed. You can leave a response, or trackback from your own site.